I did something last month that I hadn’t done in 17 years. I drove from the DC area to Pittsburgh and back by myself. Let me explain why and what I discovered during the drive. The process of selling my mother’s home continues. I described it in an earlier blog post. After the big clean-out push, there were odds & ends to take care of as well as some things to bring back. 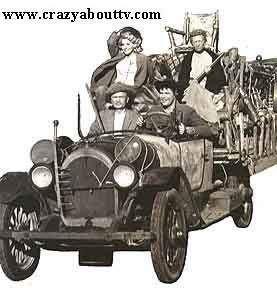 Our return trip last month resembled The Beverly Hillbillies, except for Granny’s rocking chair on top. Our car was s-t-u-f-f-e-d to the gills. The rain didn’t clear up completely until north of Morgantown, WV, 150 miles into my trip. I was in & out of rain most of the drive. Drivers generally slowed to accommodate conditions; and most, but not all, drivers had their headlights on. Do drivers think “If I can see, I don’t need headlights”? It’s not about you, Mr. or Ms. Driver, it’s about other drivers seeing you. Turn ‘em on in the rain. Please. (It’s also the law in several states.) And turn ‘em on fully; because if you have automatic headlights or daytime running lights, your car’s rear lights don’t go on automatically. And so your car is virtually invisible from behind when driving on wet roads with road spray. Note to self: Next time, download some podcasts. Trying to listen to a streaming ‘cast is iffy at best and depends on your smartphone’s access at any given point on the trip. Now you wouldn’t think that stink bugs would bother one going <cough cough> “the speed limit,” would you? You would be right. But if one is at a near-standstill on the interstate? Yup, stink bugs are an issue. As I was trying to get of I-68 to US-522 in Hancock, MD, some %#@!&@ someone wouldn’t let me over to the exit. Result: I had to get on I-70 and was stuck smack dab in a backup! It was a nice day, so I rolled my windows down. But, uh-oh, what do I spy but a stink bug about ready to fly into my car. Eek! After raising the window, I looked around and could see stink bugs flying around in the air. Not quite a swarm, but visible nonetheless. It reminded me of the year (2004) the Brood X 17-year cicadas invaded our area. They were more buoyant while than the lumbering cicadas, but there they were! Ugh. The problem is, stink bugs don’t hibernate for 17 years. They keep coming and coming and coming and…. Arrrrrrgh. It was a good trip. My husband and I usually make it to Pittsburgh in a little over 5 hours. It took me about 7 (northbound) and about 8 southbound (because of traffic jams on both I-70 and I-495). I was going a little north of Pittsburgh, so that’s why it took longer. (I do drive a little slower than he does, too.) It’s definitely more enjoyable with a traveling companion, but I would make the trip again by myself. Thank you for staying with this long post. If you have any comments about road trips (or any other topic), please leave a comment. This entry was posted in Travelogue and tagged interstate, rest stops, Road trip, Steelers Nation, stink bugs. Bookmark the permalink.